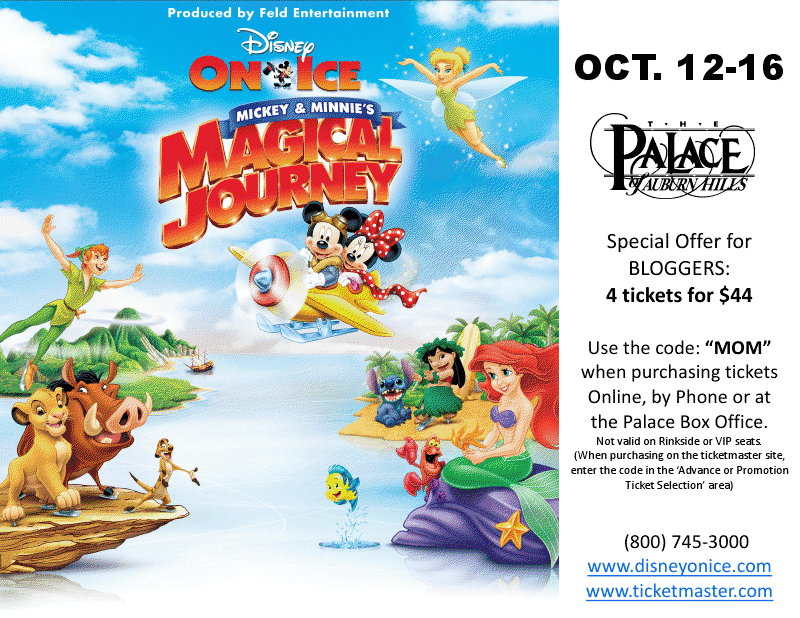 Sweetly B Squared: Disney on Ice - Coming Soon! Disney on Ice - Coming Soon! Boy was I excited to open my email and see that Disney on Ice presents Mickey and Minnie’s Magical Journey is coming to the Palace of Auburn Hills next month! Bloggers can once again get four tickets for $44 by using the discount code "MOM" when purchasing online, by phone, or at the Palace box office. I don't know if I told of my stress at the last show we went to (Maggie DESPERATELY needed to use the bathroom when we arrived, and there is no facility until after you pick up your tickets and get past the gate security), but this time we'll have no such problems - our new house is just minutes from the Palace! Maggie thinks Disney on Ice is always happening at the Palace, and she's been pretty perturbed that we haven't been again lately. She's very excited to introduce her new little brother to the fun next month. The show runs from October 12 - 16. Hope you can come out and see it too! it's awesome that you won't have the drive anymore! !